Last September, Katie and Allison Crutchfield’s first major band PS Eliot reunited for a brief tour and the results were quite impressive. The show we captured at Market Hotel was one of the best nights of last year. 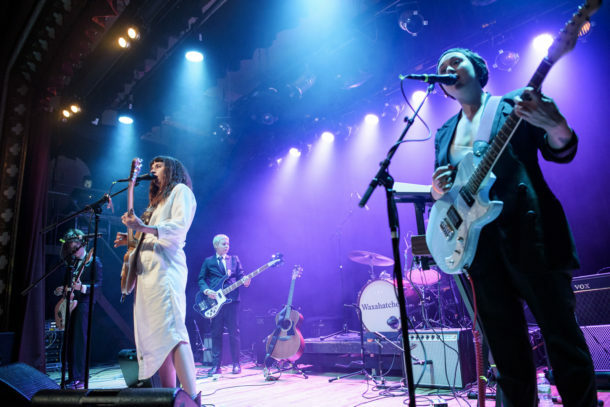 Ten months later, Katie’s main band Waxahatchee has released its latest album and it appears that last year’s return to the earlier emo/punk of her career influenced the sound of the new album. Out In the Storm (Merge Records) was produced by the great John Agnello whose credits include Dinosaur Jr. and Sonic Youth, and it comes as no surprise that this is the most guitar-centric Waxahatchee album. That being said, its also undoubtedly the best sounding album in the band’s catalog and the song-writing fits perfectly with the production. The record chronicles the inner conflict of a person going through a difficult break-up and the anger and aggression and the power production matches perfectly. Waxahatchee is currently on tour and the Brooklyn show was advertised as an album release show. Katie and Allison are originally from Alabama and currently live in Philadelphia, but each have great affection for Brooklyn. And as became obvious at this sold out Warsaw show, the borough loves them too. This was the largest show in the band’s history and they certainly rose to the occasion. With a crack band behind them, the sisters played a powerful set of material from the the last three albums mixed pretty evenly, but it was the newer tracks that brought the energy. If music is the universal emotional healing elixir, then whatever damage was suffered by the protagonist of Out In The Storm should have been thoroughly exorcised by the close of this outstanding show. Waxahatchee is on an extensive world tour that last through November. Their many dates on posted on their Facebook page [here]. I recorded this set with the Neumann hypercardioids mixed with and board feed, and the sound is excellent. Enjoy!